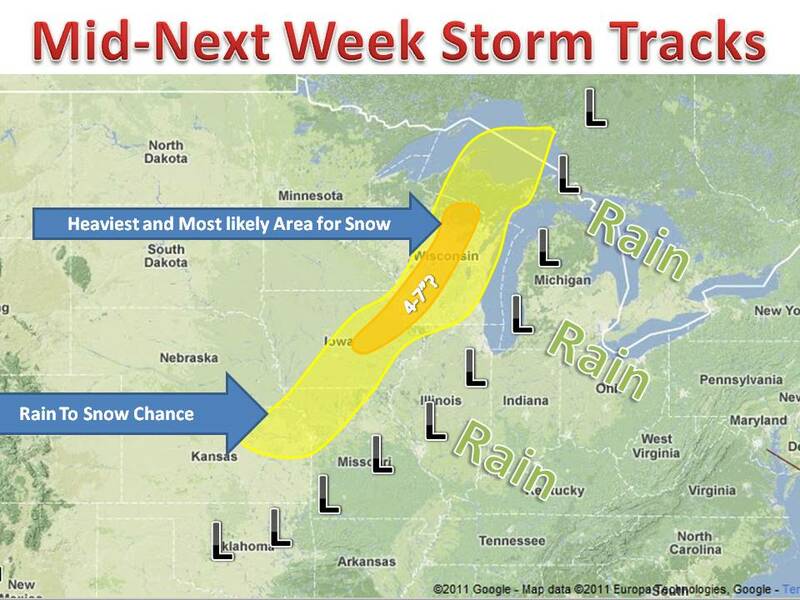 Next week in the midwest could get very sloppy for some. As of now, the main computer models have the storm moving up from OK and passing through Chicago and then into Canada. The storm will outflow rain ahead of the system on tuesday. Tuesday night the main low pressure travels on to the north bringing cold air and the high likelyhood of snow. It will start as all rain for nearly everyone before changing to all snow for some (see map). The outlined yellow area shows a greater than 50% of snow and the orange area shows where the heaviest snow would occur. I put 4-7" as of now in the orange area. Believe it or not computer models have up to a foot of snow in this area, this is well overdone. Meanwhile, rain will occur in areas east of the yellow outline. Current estimations would have 1-2" of rain in these areas. Please note: this analysis was based on the GFS, the European model has everything shifted west about 75-100 miles. The models will converge as time nears. Also this is the how the models play it out as of now. 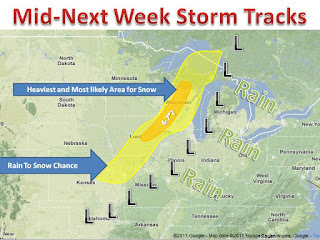 The first snow is always the toughest to forecast so keep it here at midwest weather talk for updates leading up to the storm!